I am back from Hong Kong with the late flight at 9:45 pm via Shenzhen. The Monday that just past was a busy day for me, after my absence in office for five weeks. Everyone including the Ayi, seems to have something to say to me. Now, I have left Shanghai and now I am sitting at the desk of Shangri-La Hangzhou. I will start my journey in Zhejiang from tomorrow. 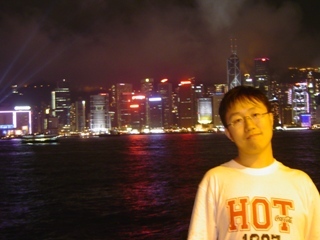 Jian Shuo before Standard View of Hong Kong Island. Photographed by Wendy. Well. Considering it is already early in the morning, I won’t talk too much about the Hong Kong trip this time, although I have so much to talk about it. Hong Kong is an exciting and attractive city. This first time visit helped me to learn that there is still a very long way for Shanghai to catch up with the standard Hong Kong built and maintained, as a friendly metropolitan, as a business central and as a tourist city. Here is what is the key learning this time. I will find more time (maybe this weekend) to explain the trip in more details. Hong Kong is a city with great usability (as Eric said). Look at the Hong Kong metro – so effective and so clear. I like boats there – the star ferry is fantastic. I also took private boats and fasterTurboJet. I love the islands around Hong Kong – we visited Cheung Chau, and Lantau (the Sea Ranch). – Thanks for Minji to host us on her small island. I took about 600 pictures there and it takes sometime to upload it to this website. I will be back. Wendy and Jian Shuo would like to thank Minji and the German girl (we didn’t know her name yet) for hosted us on their 50-residents island, and Eric for professional tour guiding. I think you looks older than before. Wow. How did you manage to do/experience so much in just a few days? 600 pictures in ~ 3 days!! Wow! Thats impressive! Looking forward to seeing them on your blog. don’t work too hard,jianshuo! take care.